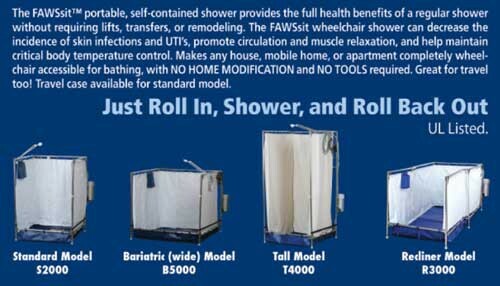 FAWSsit Portable Wheelchair Shower is available in five separate models to better meet your specific needs. The differences between the models are the sizes. 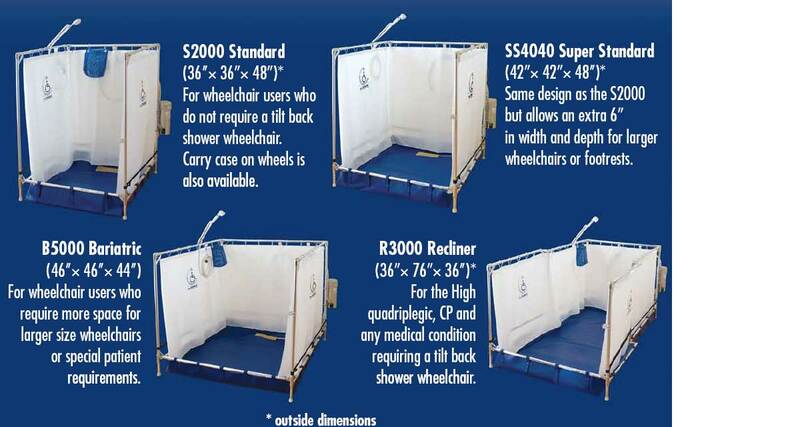 Larger sized showers accommodate recliner wheelchairs and bariatric wheelchairs. There is also a shower for tall individuals. 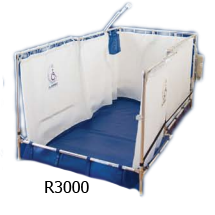 Designed for use by wheelchair patients, these portable showers can be used by anyone and are easily transportable to use while camping. 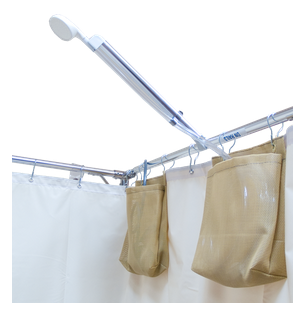 These portable showers can be folded and stored after use. 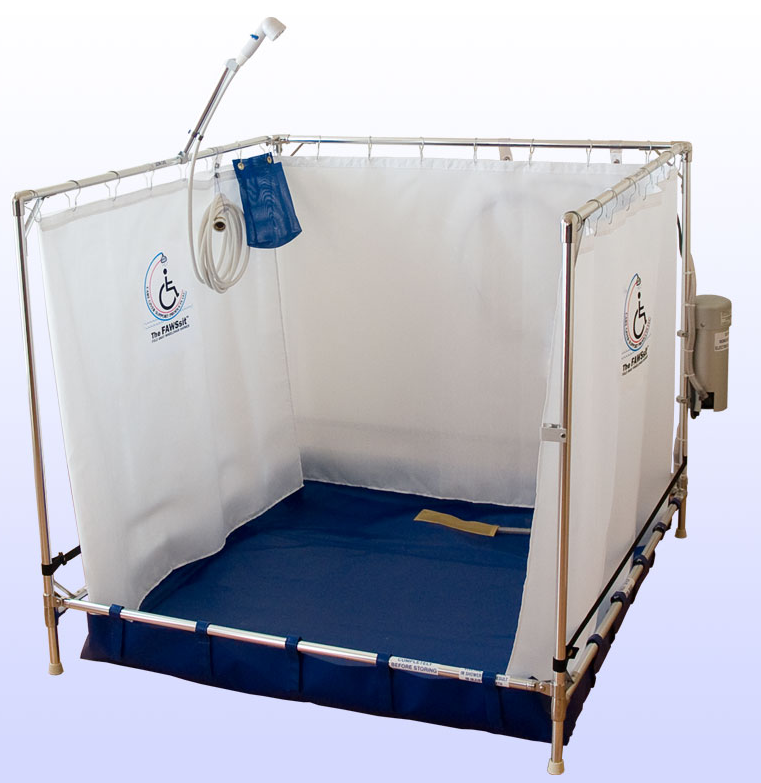 FAWSsit provides portable shower stalls, allowing anyone in a wheelchair to take a shower in any room! 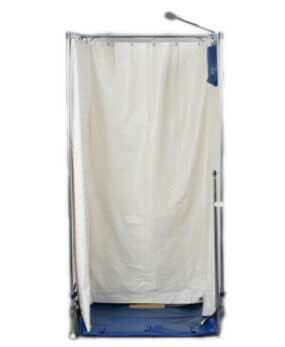 Privacy curtains on each side offer a full enclosure. The curtains are made of germicide-imbedded vinyl to help prevent mold or mildew. The durable canvass bottom protects your floor from waste water. An attached wet/dry 110V pump is plugged into a GFI outlet and removes the water to a nearby drain. 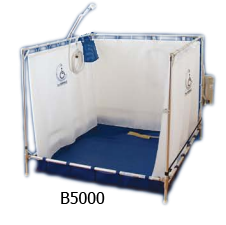 This device allows individuals an inexpensive way to bathe when conventional baths or showers will not suffice. 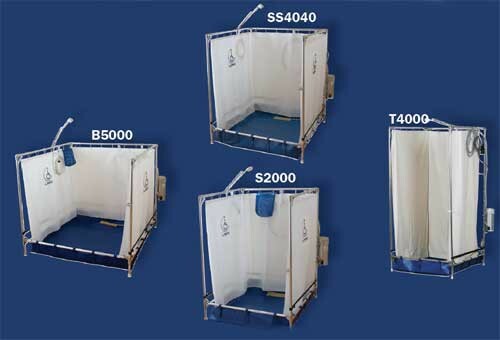 The FAWSsit showers are compact and foldable, enabling you to store them when not in use. 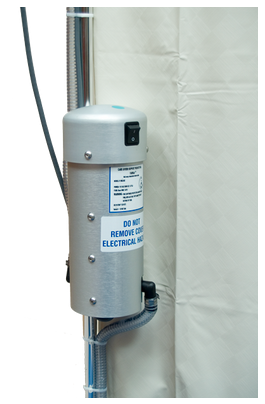 Vitality Medical carries many products to support disabled bathing, including Hand-Held Showerhead, Spray Massager, Shower Benches and Transfer Benches. May be used as a handicapped shower. Roll in and roll out shower. 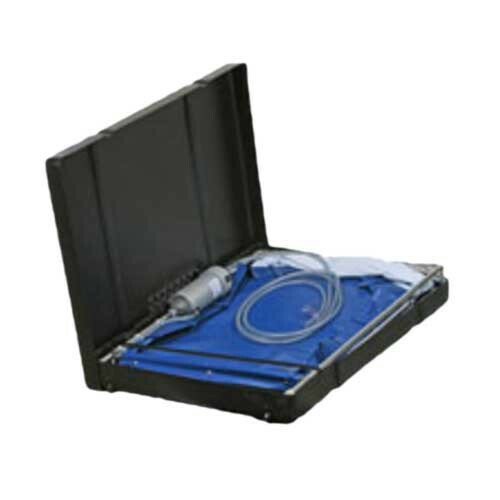 Double layer vinyl drain pan for leak protection. Custom designed diaphragm wet-dry pump. Product Numbers: S2000, SS4040, R3000, T4000, B5000. 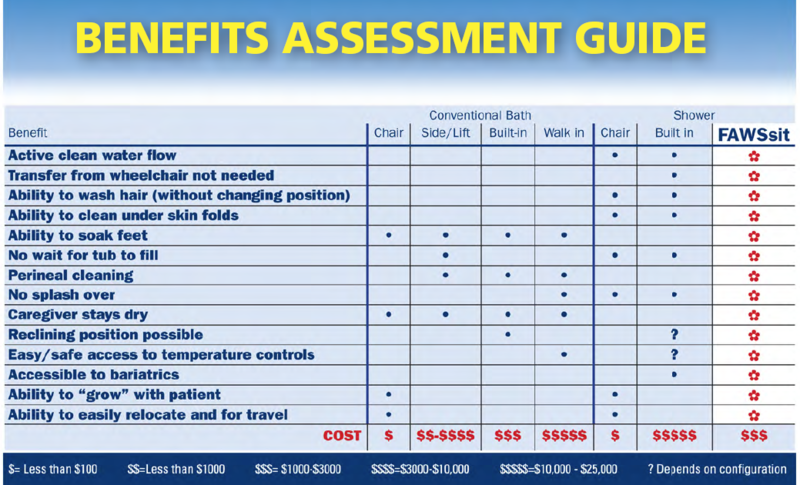 Model Options: Standard, Super Standard, Recliner, Tall, Bariatric. Manufacturer: Care Giver Support Products, LLC. The Standard model accommodates individuals weighing up to 220 pounds and who do not use a footrest with their standard size wheelchair. 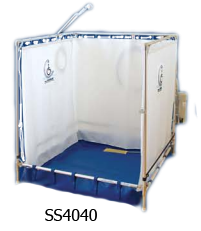 The standard FAWSsit can be folded flat to 7 x 36 inches for easy storage or transport. Folded (travel of storage) Size: 7 x 36 inch. 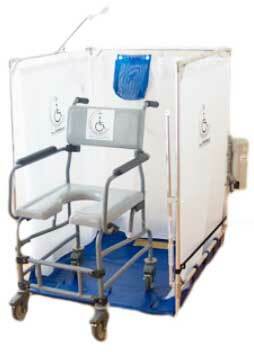 More spacious than the Standard 36 inch model, this wheelchair shower can also serve as a commode shower. 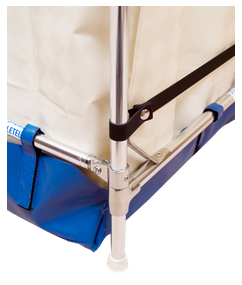 An extra 6 inches in width and depth provide for larger wheelchairs or standard wheelchairs with footrests. This model is designed for oversized wheelchairs or for wheelchairs with additional depth for foot extensions or other accommodations. Maximum Wheelchair Depth: 45 Inch. 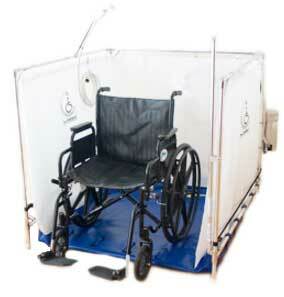 This model is adaptive to the needs of individuals who use a reclining wheelchair or a gurney. 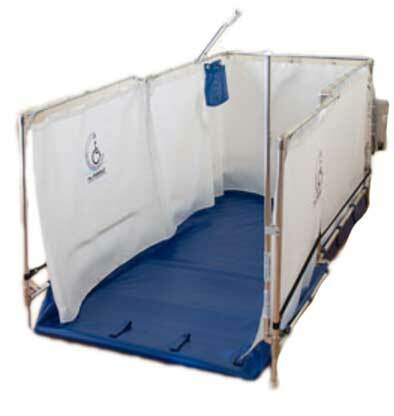 Ample room is available with this model for caregivers to assist with bathing. The R3000 Recliner has a double fold-away design that offers a full 74 inches of length. 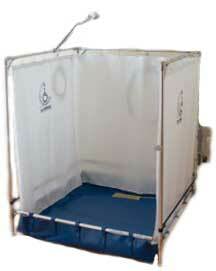 The Recliner Shower folds down flat to a 12 inch depth. Inside Dimensions: 34 W x 78 D x 36 H Inch. Outside Dimensions: 36 W x 80 D x 36 H Inch. Folded (travel or storage) Size: 36 W x 12 D x 36 H Inch. 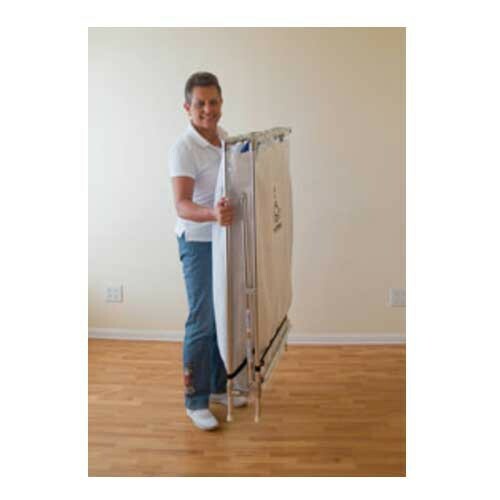 This model offers 6 feet of height to accommodate the needs of taller individuals. The size fits standards wheelchairs and free-standing individuals. It is ideal for a camping shower. Brochure covers the highlights for the fold away showers. Quick Set Up Guide details the quick and simple steps to set up the shower for use. 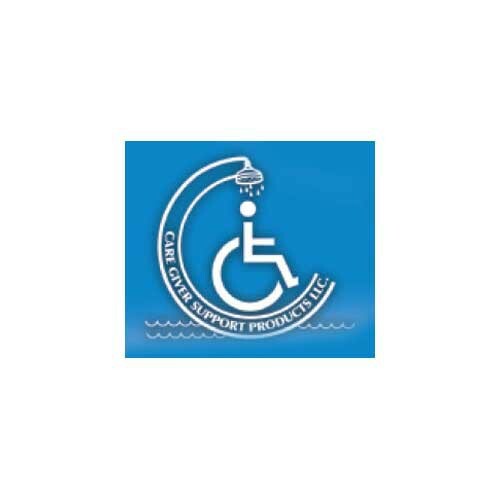 Features and Benefits presents key points for these showers designed for the handicapped and for camping. Recliner R3000 Wheelchair Shower details for the recliner wheelchair shower. FAWSsit Operation & Maintenance Guide offers instructions for using this handicapped shower and for keeping it in good working order. 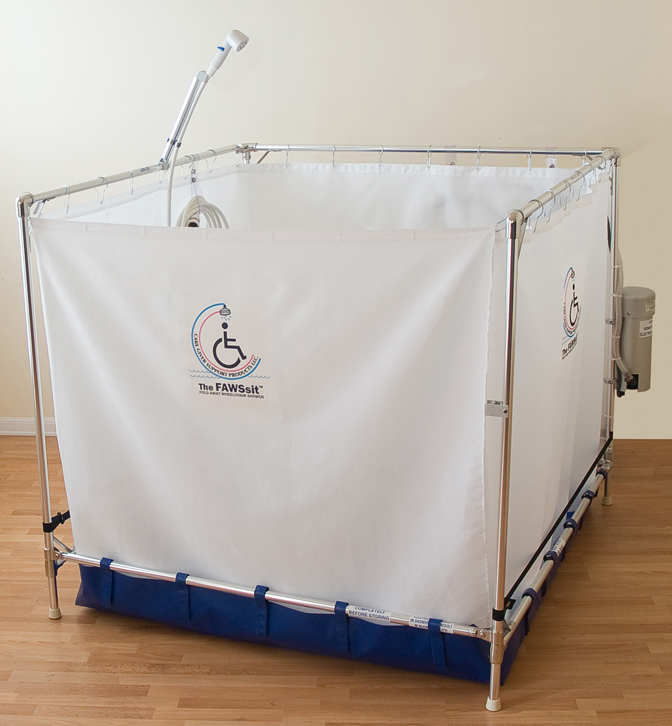 Low Cost Bathing Alternatives discusses the FAWSsit Shower for handicapped and bariatric patients. 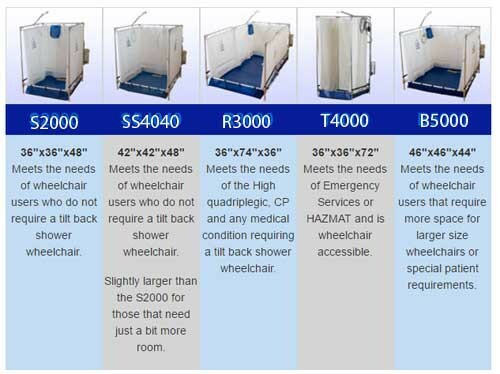 FAWSsit Bariatric Bathing article from HME Business regarding FAWSsit Fold-Away Bariatric Wheelchair Shower B5000. 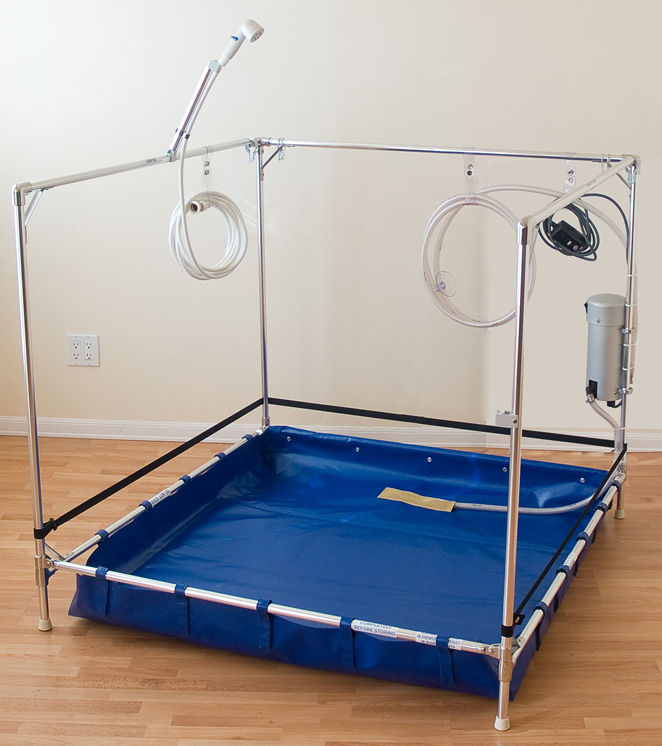 Tested by Caregivers article from Disabled Dealer Magazine offers a testimonial of using portable showers. Safety and Quality is discussed for this manufacturer. Manufactured in the USA - What it means to be manufactured in the USA. How FAWSsit Showers Work? 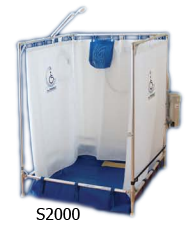 article from Disabled Dealer Magazine offers a testimonial of using portable showers. 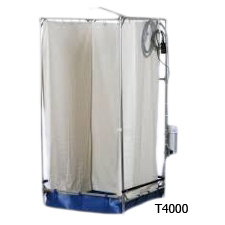 Ordering a Portable Shower details what your need to know about ordering a fold away shower. Well made and works as advertised! High quality construction. Works great and folds up to small size. We needed the bariatric size because our son needs to be reclined a bit in his shower chair. We also received one with shower handle that has an on-off control. We think that is a must have. Very are satisfied with shower.